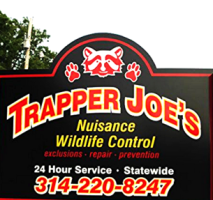 Trapper Joe's can put your mind at ease when you're dealing with a wildlife invasion. From raccoon removal to bat removal, we can stop the problem at the source and keep it from coming back. Besides wildlife trapping and Removal, we offer total home exclusions, warranties on our repairs and preventative measures, and we travel throughout the greater St Louis are. If you've seen a pest on your property, chances are we've dealt with it. Even wild animals like coyotes, raccoon's and feral hogs are no match for our team. We keep our prices competitive, and use humane techniques that are safe for your kids, pets, and the environment. To make our services accessible, we're available Monday - Sunday, 8 am - 6 pm with after hours emergency services..
We are NWCOA Certified Wildlife Control Professionals and Bat Standards Compliant. 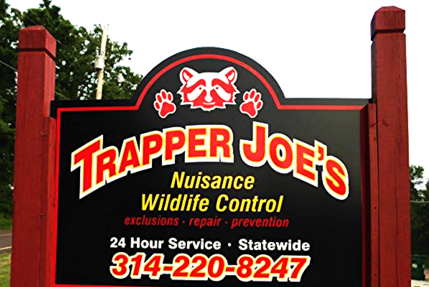 You can count on Trapper Joe's to get rid of any issue you're currently facing. We would like to be your first choice in wildlife control services, so call our office in St Louis, MO, today.